New items and old favorites have found their new display home when you include one of our Single Sided Wire Mesh Basket Display fixtures. This wire basket display features a solid metal design that will not only hold your product steadily but will truly accentuate your store. 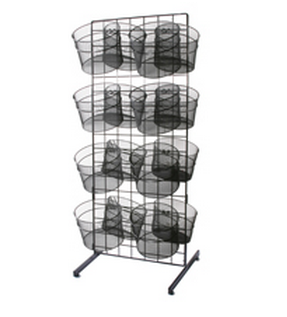 Included are eight 11" black wire mesh baskets with grid hoops for attaching easily. Showcase merchandise you wish to get noticed quicker and easier. The black frame is made with a rectangular shaped metal tubing with retractable telescoping legs and durable locking casters. 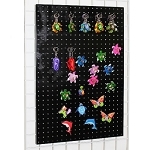 Move this freestanding wire display with ease and advertise impulse materials against the wall or in the middle of a room. The choice is yours. What are you waiting for? 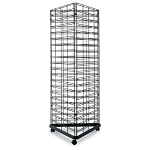 Order your single-sided wire store display rack today at Candy Concepts Inc.